Click above title to read the recently published paper authored by Dr. Peter Hersh, medical monitor of the U.S. crosslinking clinical trials. At the CLEI Center for Keratoconus, we have been treating our patients with corneal collagen crosslinking (CXL) for over 10 years, starting in February, 2008, and have performed over 1000 treatments. As lead author and medical monitor of the U.S. clinical trials of crosslinking, Dr. Hersh played a key part in U.S. FDA approval of CXL for keratoconus and corneal ectasia. All of us at the CLEI Center for keratoconus thank our many patients who participated in the study and are grateful that this important procedure will now be more widely available to keratoconus patients. If you have any questions, please contact us at 201-883-0505 or email info@vision-institute.com. Click below as Dr. Hersh discusses the results of the crosslinking clinical trial. Corneal collagen crosslinking is the only treatment available that can help decrease the progression of KC. Remember, keratoconus is caused by a weaking of the corneal structure, leading to distortion of the cornea's normal, domelike, smooth optical architecture. Because of this structural weakening, keratoconus tends to worsen over time. The goal of corneal crosslinking is to make the cornea stronger so it does not continue to distort. In most cases, crosslinking does not affect your vision. Other procedures such as Intacs, TG-PRK , or lens implantation may be suggested for ultimate improvemet in the quality of your vision. 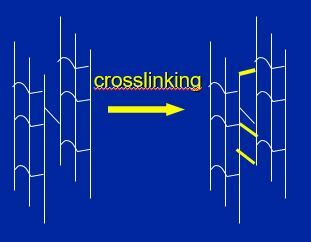 Crosslinking uses riboflavin (Vitamin B2), a photoactive compound, in conjuction with ultraviolet light (UVA 365nm). The intereaction of riboflavin with the UV light causes a photobiologic reaction in the cornea leading to formation of molecular bonds. 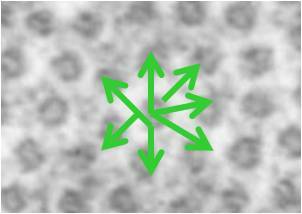 Via this interaction, the primary goal of collagen crosslinking in the keratoconic patient is to strengthen and stiffen the corneal fibers (much like placing additional cables on a bridge to help support it) in order to decrease the progression of keratoconus, and to decrease the cone steepness in some patients. Molecular Crosslinks Corneal Collagen Fibers Linked Corneal Collagen "Pancakes"
Corneal crosslinking is performed at the state of the art CLEI Center for Keratoconus in Teaneck NJ (close to NYC airports, Morristown, and Princeton) by Dr. Peter Hersh. At the start of the procedure, anesthesia drops are administered to keep you comfortable. A lid retainer will be placed to prevent you from blinking. In most cases, the surface epithelial cells of the cornea are then removed and riboflavin drops are administered for approximately 30 minutes. The riboflavin acts both to enhance the crosslinking effect and to protect the rest of the eye from the UV exposure. The ultraviolet light source is then aligned and you will then look up at it with continued addition of riboflavin drops for the remainder of the procedure. At the conclusion of the procedure, a soft contact lens bandage is applied to keep the eye comfortable and to protect the surface of the cornea during the healing process. 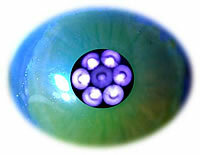 The contact lens is left in place to improve healing for approximately 4-5 days and is then removed in the office. Antibiotic and anti-inflammatory drops are used for approximately two weeks afterwards. The first phase of healing is the early period 1-5 days when the surface epithelial cells heal. Generally, a bandage contact lens will protect the cornea and make it comfortable during this time. However, there may be some discomfort for which we will give you appropiate medication. You will be able to see through the lens, but vision will be hazy during this time (like driving with a foggy windshield). In some patients, vision may continue to be mildly hazy for several months, but, in general, most patients note a return to their baseline vision over the first few weeks. Contact lenses can be restarted after we are satified with the early healing, usually around 1 month after the procedure. Remember, collagen crosslinking is designed to decrease the progression of keratoconus and corneal ectasia. It is not meant to improve your vision. There are other procedures that can be used to further improve your vision. It is important to know that, although crosslinking has been shown to be successful in most patients, it may not work in all cases and keratoconus may still continue to progress. Not every keratoconus patient requires corneal crosslinking. 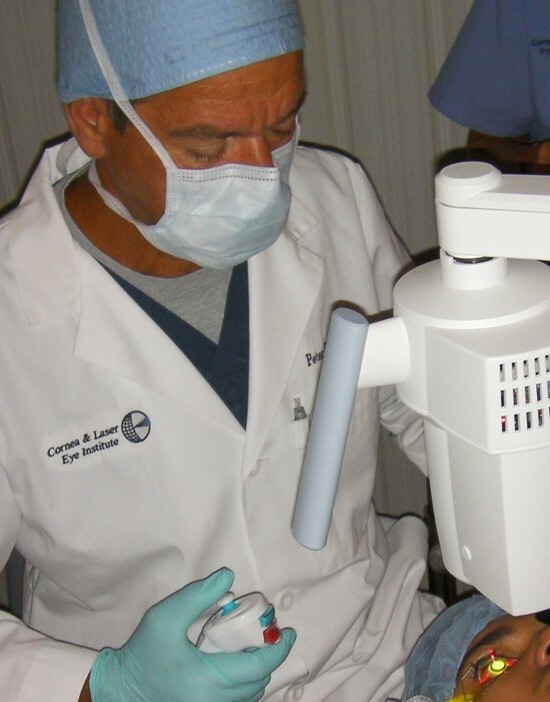 The primary goal of CXL is to decrease further keratoconic corneal distortion. Some patients are already stable (usually older patients) and would not need crosslinking. There are other keratoconus patients (around 25%) who may respond particularly well, with improved vision and corneal contours. We have done a study to determine who are the best candidates as described in the video below. If you have an interest or have any questions about collagen crosslinking or other keratoconus treatments, please call our office at 201-883-0505 or email info@vision-institute.com. By means of this corneal biomechanical strengthening, the essential clinical goal of corneal collagen crosslinking in keratoconus is to decrease disease progression over time. Since the severity of KC is generally related to the degree of steepening and irregularity of the corneal optical architecture, the primary efficacy outcome for this study was based on maximum K, as measured by a Scheimpflug corneal topography system. Though not measuring all aspects of keratoconus severity, the topographic maximum K reflects the severity of the keratoconic cone, and affords an objective, quantitative endpoint for analysis that can be standardized amongst multiple study sites. The change in maximum K over time, therefore, serves as a quantitative indicator of a change in keratoconus severity. A difference of at least 1.0 diopter in the mean change in maximum K from baseline to one year, comparing the treatment and control group, was chosen as a clinically meaningful endpoint of study success. Thus, either stabilization or improvement in maximum K would indicate a positive effect of the procedure on disease evolution, whereas an increase in maximum K would suggest continued progression. The mean maximum K value of the crosslinking treatment group decreased by 1.6 D at 1 year, compared with 1.0 D steepening of the control group, a difference of 2.6 D between treatment and control. Thus, our study demonstrates that crosslinking has a beneficial effect on corneal topography in keratoconus patients over one year. This salient finding is in agreement with a number of international clinical trials using a similar protocol, which found decreases in maximum K value of 2.01 D3 1.90 D,19 1.46 D,20 and 1.42 D21 after crosslinking. In addition to improved maximum K, other topography and wavefront analyses of a single center cohort of patients by one of the authors (PSH) demonstrate a more general optical improvement after CXL, finding that quantitative descriptors of corneal topography22, as well as both corneal and total ocular aberrations23, improve one year after crosslinking. In addition to the primary efficacy measurement of maximum K, changes in CDVA may point to additional benefits or, conversely, to safety concerns after crosslinking. Since decrease in vision in keratoconus results from a distorted corneal optical architecture, topography improvement would be expected to yield improved visual function. Indeed, in this study, crosslinking was associated with an improvement of more than 1 line of mean CDVA 1 year postoperatively. Although this finding was statistically significant, the actual clinical significance is better demonstrated in studying the outcomes on an individual basis; among patients receiving CXL, twenty-three eyes (24%) gained 2 or more lines of CDVA, whereas 5 eyes (6%) lost 2 lines or more. Thus, nearly one quarter of patients enjoyed a clinically meaningful increase in CDVA as a result of crosslinking, whereas some eyes do continue to progress. Our findings are in agreement with previous studies by Vinciguerra and associates27, which found that mean CDVA improved between one and two logMAR lines at 12 months postoperatively. Similarly, at 1-year follow-up, Caporossi’s group28 and Raiskup-Wolf and colleagues20 found improvements in CDVA, noting continued improvement even after 1 year. With regard to those 5 eyes in our study who lost 2 or mores lines CDVA, 2 showed continued topography progression, 2 had residual corneal haze or scar, and one had no potentially contributing cause. In the aforementioned multifactorial analysis25, the only independent predictor of a change in postoperative CDVA after CXL was the preoperative corrected distance visual acuity; those eyes with worse preoperative CDVA (<20/40) were 5.9X more likely to experience an improvement in vision one year after crosslinking. However, with regard to eyes which lost vision from the procedure, the most salient indicator of an unwanted outcome, there were no independent preoperative predictors. Analysis of UDVA showed slightly less than 1 line average improvement in our study. This improvement is somewhat less than previously reported. Vinciguerra’s group27 reported a significant improvement in mean UDVA, from 0.77 logMAR preoperatively to 0.57 logMAR 1 year postoperatively. Similarly, Caporossi and colleagues29 reported a significant improvement in mean UDVA of 2.41 Snellen lines. In addition to these visual acuity improvements, it is notable that many patients appreciated a subjective improvement in a number of measures of their visual function after the crosslinking procedure.30 (Figure 6) Although we did find statistical significance in these subjective improvements, the actual clinical impact of these improvements remains unclear. It is important, clinically, for the ophthalmologist to understand the tempo of healing and outcomes evolution after crosslinking, both to identify untoward effects and to properly counsel the patient’s expectations. Topography and vision outcomes seem to follow a reproducible time course after treatment.31 Looking at the changes over time in the crosslinking treatment group, there was a worsening in maximum K at 1 month, with improvement thereafter, continuing over one year (Figure 3). The time course of CDVA change was similar, with a slight drop at one month, followed by improvement (Figure 4). Endothelial cell damage from crosslinking is a concern, and could potentially result from endothelial exposure to free radicals generated from the crosslinking process. The original parameters for CXL suggested a minimum stromal thickness of 400 um to attenuate the UVA power and thus prevent endothelial damage.40,41 Indeed, in the study protocol, corneas needed to be swollen with a hypotonic riboflavin solution to the 400 um threshold before proceeding with UV exposure.42,43 Results herein showed no damage to the corneal endothelium and no reports of corneal decompensation after crosslinking. Microbial keratitis likely is one of the most severe potential complications of CXL. In this study, there was one reported corneal ulcer which occurred in a patient initially assigned to the control group, who subsequently had the CXL procedure. Since a total of 293 eyes ultimately received crosslinking in this trial, the incidence was 0.3%. 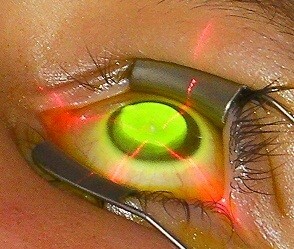 There have been several reports of microbial keratitis after CXL in the literature, including bacterial, fungal, acanthamoeba, and herpetic.44 Given the epithelial defect and use of a therapeutic contact lens in the crosslinking procedure, care should be taken to assure rapid re-epithelialization, treat ocular surface pathologies, and maintain careful postoperative followup to detect early complications. Concluding, this randomized, controlled clinical trial demonstrates the efficacy and safety of corneal collagen crosslinking for the treatment of progressive keratoconus. In addition to decreasing disease progression, crosslinking also can have beneficial visual and optical effects such as decrease in corneal steepness and improvement in visual acuity and subjective visual function in some patients. Although this trial assesses results over a one year period, international studies have reported good stability over 10 years.46 Indeed, the beneficial clinical effect of crosslinking is highlighted by Sanvik and colleagues47, who report a more than a 50% decrease in the frequency of keratoplasty in KC patients in Norway, comparing a period before crosslinking was available with a similar period after crosslinking became well established. Certainly, the topography and visual results reported herein support the efficacy of crosslinking in the stabilization of this progressive corneal disorder.